With parents who reside in Spain, paella is something my whole family loves, my mum has been taught how to cook it by the locals. This weekend with my mum in the UK at my home I decided to cook her my version. It’s probably not a true paella but hey, it’s tasty family food and a one pot meal that you can put in the middle of the table so everyone helps themselves. Of course you could totally add chicken, fish or your own favourite vegetables to this, I used what I had in my kitchen. Make your own version and let me know how it goes. Place the spices in a large wide based pan on a medium heat, add the boil and cook for a couple of minutes. Add the chorizo and allow it to release its oils. Next add the garlic and rice, cook for 2 minutes. Then add the stock, dried herbs and lime leaf. Allow this to simmer whilst you prep the veggies, you could use any veggies you like! Add in the vegetables one at a time and stir in. Add the water and place the lid on the pan. Allow it to simmer until the rice is cooked. Finish with the lemon juice and prawns, allowing the prawns to cook in the pan with the rice for a few minutes. Finally add the herbs, taste and season. Check out a little video of us cooking it here. My 7 year old girl was on “sous chef” duty tonight and she totally enjoyed helping out. Her tasks were to measure the rice using the Carb Spoon, to cut the chorizo up, grate some vegetables, add them and stir the pan. She added the stock, picked the herbs and chopped them too. Plus she got the prawns out of the freezer and added those for me. 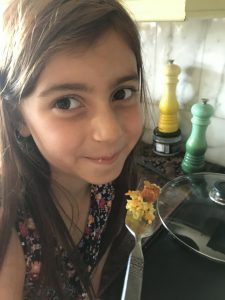 I’m trying to get my children to each cook with me once a week, making it a scheduled activity and time with mummy all at once. It slows me down and means more planning is needed but it is also teaching them valuable skills. With parents living in Spain I’ve eaten a fair bit of paella and I must admit it’s yummy but often very rich and just a bit too much for our tummies. I’m also wheat intolerant and let’s just say that the area of Spain my parents live in is NOT good for special diets. We went out for tapas today and there was nothing suitable for me to eat. So as true Spainish residents my parentals set about cooking up a huge paella feast for us tonight that was family friendly. 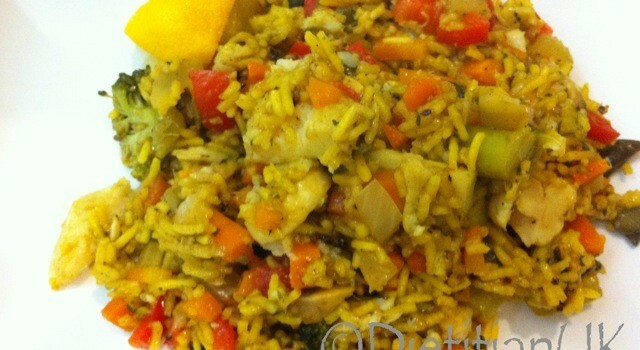 Paella for me is full of food memories. 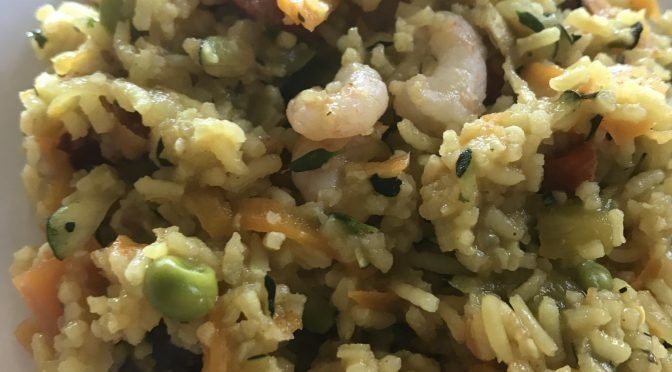 A few that stand out in my mind: I’m pretty sure it was mine and my hubby’s (then fiances’) first visit to Spain, it was Christmas and we had the most wonderful paella at a local restaurant in a town called La Cala. That food memory has led to a bit of a Christmas tradition and on quite a few years we have cooked paella over the Christmas season. A notable one being a year when everyone in my family was ill except poor hubby who had to cook it (he isn’t the best cook but did an amazing job – bless him). Our family version of paella is a celebration of veggies. 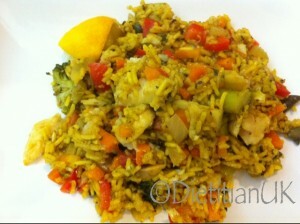 Think saffron rice, cooked in stock with peppers, whole garlic cloves, mushrooms, pea, carrots and pumpkin seeds. As I’m pregnant so staying away from too much seafood this version just had white fish in. We tend to make this dish by starting off cooking chorizo or pancetta, onions and garlic in a little oil.Add peppers,, broccoli, carrots and mushrooms, cook till softened. Add saffron, paprika and rice. Traditionally Spainish short grain rice is used but you can use basmati. 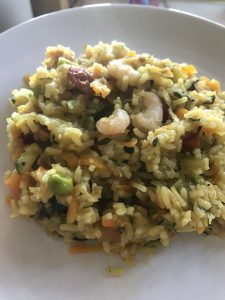 Coat the rice in the oil and spices, then add some white wine, when it is bubbling add a good quality stock and stir frequently like a risotto. Add the fish and cover with a lid, let it cook for about 10 minutes. Now add peas and a combination of fresh herbs, allow to cook gently until the rice is ready. Add the seafood at the end of cooking, cover with a lid and it will cook in the steam. Paella cooked like this at home really is a whole family dish, you can put whatever you like it in, just cook it slowly like you would a risotto and make it your own. What would you add in to a paella? Do you have any paella stories to share?